So I got the No Way stamp set from Avery Elle and I knew I wanted to create a fun card with such gets sentiments like Holy Guacamole. I went through Pinterest and eventually came up with this fun fiesta design. 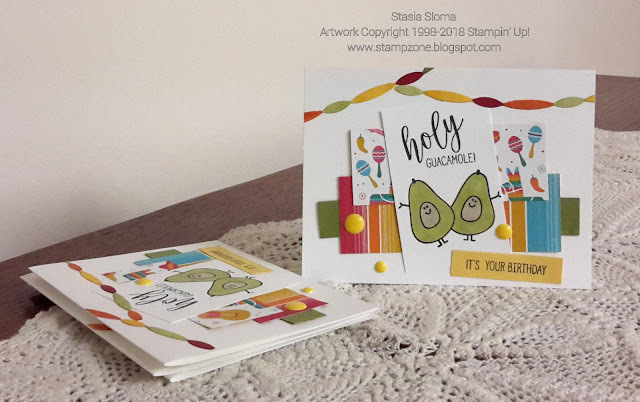 I bought the Fiesta Time die and Festive Birthday Designer Series Paper and I have not created as many cards as I thought I would with all the fun designs in the paper pack. The banner was die cut and then colored in with my Stampin' Blends. Enamel dots complete the card. That’s a fun serie !